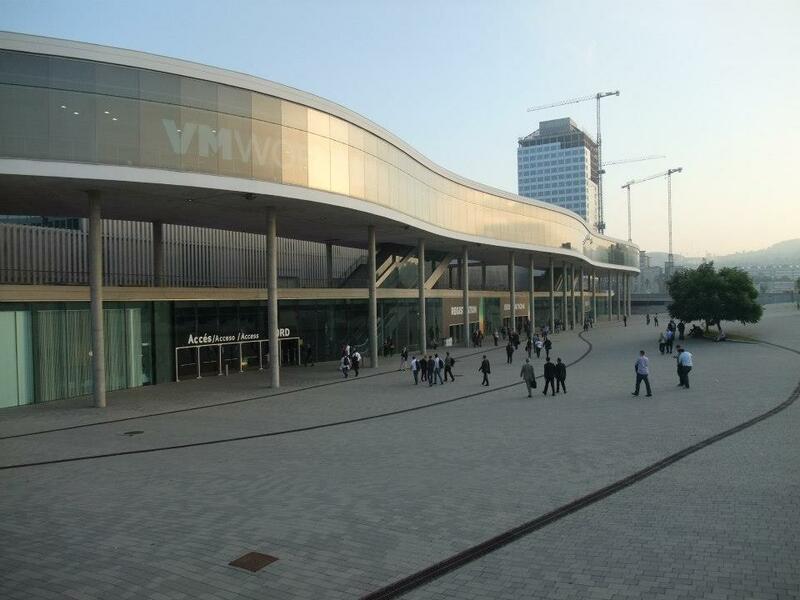 Arrived yesterday afternoon in sunny, hot and humid Barcelona in preparation for VMworld Europe 2012. Having registered, taken a lab session (on the vCloud Suite), settled into the hotel and eaten an evening meal in a small, local cafe (where the owner knew no English and we knew no Spanish, which made the whole affair very interesting), I made sure I had an early night because this conference is going to be packed. The keynote kicked off at 9am. Not a huge amount of new stuff announced after the US show, but there is a new version of vCenter Operations Manager (aka VCOPS) which now includes application awareness so you can drill into a VM and get the state of the underlying application (such as the RAM utilisation of an individual Oracle instance). 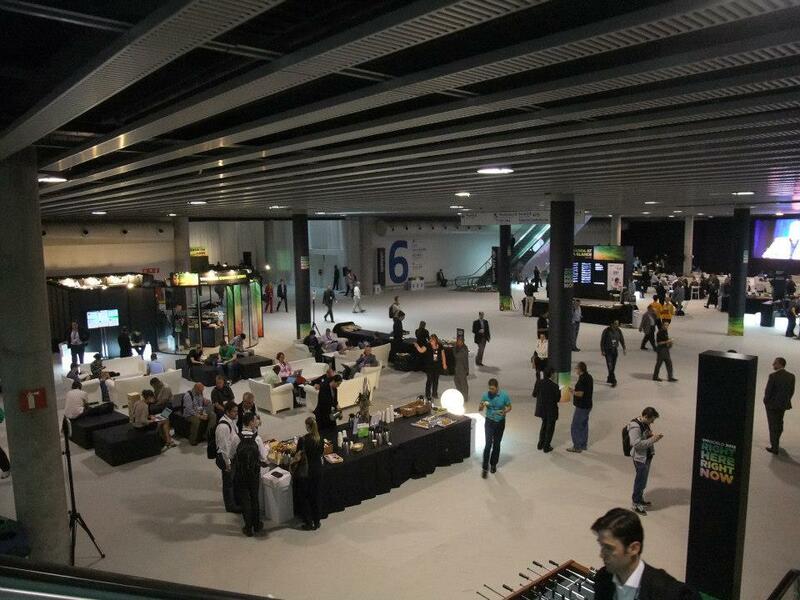 While this is very impressive, unfortunately, VCOPS remains reassuringly expensive (but see below for some good news). A new plugin was shown that allows the vSphere client to manage third party hypervisors. This, along with both DynamicOps and Nicira supporting multiple hypervisors, is a new approach by VMware and probably reflects the reality in many datacenters. The vCloud Automation Center was revealed, which is based on VMware's acquisition of DynamicOps. This showed the ability for end users to request new VMs from a catalogue and to have management over their VMs (power on, off, restart etc.) through a web portal. This looks like an essential component in the provisioning process, fulfilling the self-service aspect of the cloud while facilitating an approval process, but according to the VMware website, it's priced at $400 per managed VM(! ), which makes it too expensive for all but the largest customers. The new vFabric Application Director was also shown, with the introduction of the idea of "application blueprints" which take the concept of VM templates to the next level, allowing a drag and drop approach to building an application stack. The Cloud Application Marketplace (aka App Store) was shown where third parties can publish their own blueprint components, allowing for even more sophisticated application stacks. As an example, the screenshot showed some Riverbed components, so you could imagine integrating WAN acceleration into your one-click-to-deploy vApp. The list price for this is $6250, which, like the above, is going to be difficult for many of us to justify, no matter how cool. A couple of screens were shown of the IT Business Management Suite, which would make a CIO very happy. Lots of cost related metrics and pretty dashboards, but not something I'll personally have any need for. The keynote ended with a demo of a social networking project. In the demo, hosts, clusters and VMs are social network entities that can be "followed" and "liked" in the same way our Facebook friends can be "followed" and "liked". If a host loses a datastore, it posts a message to the news stream. Other hosts that have the same problem "like" the original message which can be used for analytics. If dozens of hosts all report that they have lost access to a datastore, then there's probably a serious issue. All sounds a bit gimmicky, but it did look pretty decent and got the biggest, most spontaneous applause of the keynote(!). VMware offer so much more than just hypervisor-based virtualisation. Where other hypervisor vendors sometimes compare vMotion/Live Migration capabilities, play "My VM is bigger than your VM" (VMware are guilty of this too), and fight to see who offers the most features for free, the VMware strategy is now about the datacentre and everything in it, automating and orchestrating according to policy. In VMware language, this policy based automation is referred to as the "Software Defined Datacenter" (SDDC) and is a logical continuation of the ability to virtualise resources. We're now comfortable virtualising compute, storage and network connectivity, but VMware are looking to extend this to network edge devices (load balancers, WAN compression, firewalls etc.). While virtual appliances already exist for some of these, the big difference is that the SDDC is built on the idea that these devices can be scripted, orchestrated and therefore automated by policy. This further extends (through the vFabric suite) into the application layer. A negative comment regarding the keynote announcements, it is frustrating that customers who opted for the top end solution in the VI3.5 days with the Enterprise edition were left in the cold with 4.0's introduction of Enterprise Plus and subsequently upgraded, are now migrated to vCloud Suite Standard which still leaves many useful features out, only available in vCloud Suite Advanced and Ednterprise. I understand that each edition adds many new features, but it seems like a ploy by VMware to constantly generate new revenue by making customers pay out for ever bigger software solutions. Also in the Solution Exchange, I had a conversation with Veeam about support for vCloud Director and end user, self-service restores on backed up VMs. Nothing yet announced, but Backup and Replication release 7 should be interesting next year. There was also the suggestion that tape support was coming, but on later reflection, this may have limitations for those of us running a purely virtual Veeam deployment. The Solution Exchange was also the venue for an unexpected encounter with Brent Spiner who was signing photos and chatting to people! And, to the probable dismay of my wife, I now own a red fedora, courtesy of Red Hat (and she thought last year's bandana was bad...). The rest of the day was filled with sessions, including an excellent multi-vendor presentation on storage best practices by Chad Sakac (EMC) and Vaughn Stewart (NetApp). Storage is a topic of interest to me and I've read up a fair amount on it, but was pleased to find myself noting down many "to-do" items for the infrastructure I manage. Very useful! The second session attended was on future storage developments, including vVols, Virtual SAN and Virtual Flash. Interesting technology and it's useful to know this stuff is coming down the road. While sitting in the Hang Space reading up on the new developments, I came across a reference on VMware's website that a new, entry level version of VCOPS called vCenter Operations Manager Foundation, will be FREE to all vSphere customers. While this removes about 90% of the product's feature set, it will be a good starting point for infrastructure management and alerting. 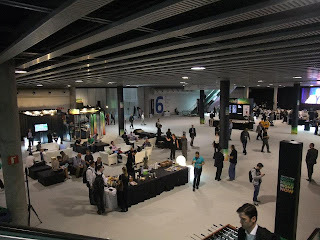 The early evening was spent in the Solutions Exchange for the Welcome Reception, basically an opportunity to engage with vendors while eating canapés and drinking free wine/beer/juice/water. And that, for me, was enough for the day! There are parties running late into the evening, but tomorrow promises to be an equally busy day, so time to get some head down time. On a less IT related note, this venue is very impressive (but not noticeably better or worse than Copenhagen). 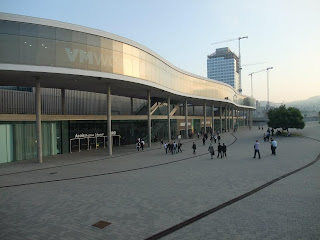 The conference centre is huge, requiring the use of those automated walkways normally found in airports to get around. There is a constant availability of free food and drink on offer and plenty of space to sit, relax and reflect on all the new developments. Credit to the event organisers who really understand their audience and do everything to keep attendees happy and focused!